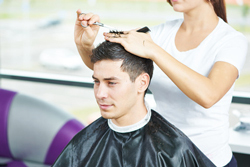 Main Barber Shop can offer haircuts for men, women, and children. These include anything from short trims to extreme length cuts. We also do layering and bang cut styles. If you want to try a dramatic look, a bald style or full head-shave is one way to go. This is a popular style among athletes to keep cool and in the summer months to lessen sweat on the scalp. Going bald is also a great style for thinning hair. It gives an even, slick appearance. 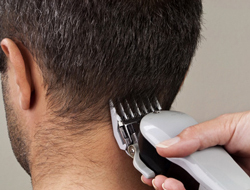 Main Barber Shop offers fade haircuts, which start with a longer length on the top and fade to a buzz cut on the back of the neck. There are several varieties of the fade, but the main look is long on top, short on the bottom. Main Barber Shop creates flat top haircuts in which the top of the hair cut to an even, flat surface and the sides are square. This is achieved with a longer length on top and shorter on the sides. The side length can range from shaved to slightly longer and we can customer this look along with framing on the sides to exactly what you want. For the bold rocker look, we can create a Mohawk. It can be shorter or longer and have totally shaved sides or short hair on the sides. These can have a flat top or spiked pieces of hair with gel. 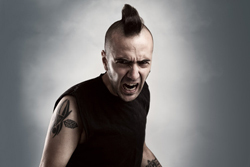 We can also create a “fohawk”, or false mowhawk where no hair is shaved. These styles look good in natural or bold, extreme colors. 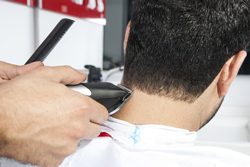 Main Barber Shop can customize your shave to any length of mustache or beard or create a clean shaven look. There are many styles we can create including a goatee, mutton chops, pencil beard, and more. If you have a specific shave style in mind, please let us know and we can create it. 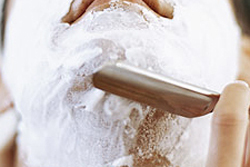 We do a full shampoo and aftershave treatment with every barber shave service. 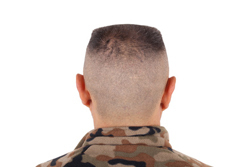 If you are enlisting in the military or simply like the clean-cut look, we offer military shaves. This is a close cut length on top of the head with shaved sides and back. The beard and mustache are almost completely shaved, leaving a shadow or buzz behind. In some cases, this can be clean shaven as well. Please let us know exactly what you would like to have done and we can customize your military shave to your specifications. There are many other cuts you can get at Main Barber Shop and the possibilities are nearly endless. We choose age appropriate cuts and cuts to match your personal style whether you’re a kid, teen, adult, older adult, or senior. We’ll make sure you leave feeling confident and looking your best. Main Barber can also offer other services by request.